Since each of our garments is made to your exact measurements, the days of searching for clothing to fit your specific body type are now a thing of the past. Your jacket should be long enough to cover all of your rear. Your pants should extend beyond the heel of your dress shoe. When you have a suit that compliments your shape and accentuates your best features, people will surely take notice. 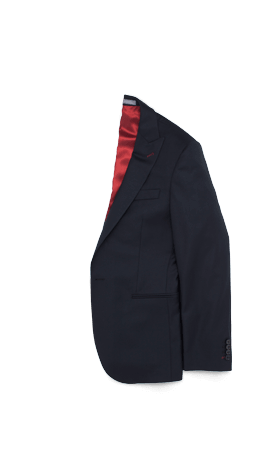 Our suits are made to fit your body, so you can rest assured you will be noticed for all the right reasons. When it comes to the most important aspect of your suit, fit will always reign supreme. The shoulder seam should end at your natural shoulder line, jacket just cover your rear and pants stop right before the heel of your shoe. Our easy to use online process will have you set up with your own measurement profile within 10-15 minutes. All you need is a friend and a tape measure and we will take care of the rest. Our smart algorithms use your height & weight to suggest measurements to guide you along the way, so you can have the confidence to get it done right. Our master tailor reviews each measurement profile and will alert our Customer Concierge team to contact you should any measurement appear to need an adjustment. Another step we take to ensure a great fitting suit. We use state-of–the-art digital cutting technology when making each of our suits to ensure we bring you a consistent product that fits the same every time. INDOCHINO is a true Made to Measure experience. Your suit, is made just for you based on your measurements, choice of fabrics and customizations. Every INDOCHINO purchase is backed by our Fit Promise. If your order does not meet expectations, let us know and we will make it right. We’re here to help. Contact our Customer Experience team and we will guide you through the process. We will help you get the suit that is perfect for you. The great part about @indochino suits is that they fit you perfectly  just the way you are.